Take-out or takeout (also called "carry-out", "take away" or "parcel") is food prepared in a restaurant that is eaten somewhere else. A concept found in many ancient cultures, take-out food is now common worldwide. There are any number of different cuisines and dishes to choose from. The concept of prepared meals to be eaten elsewhere dates back to antiquity. Market and roadside stalls selling food were common in both Ancient Greece and Ancient Rome. In Pompeii, archaeologists have found a number of thermopolia. These were service counters opening onto the street, which provided food to be taken away and eaten elsewhere. There is a distinct lack of formal dining and kitchen area in Pompeian homes. This suggests that eating, or at least cooking, at home was unusual. Over 200 thermopolia have been found in the ruins of Pompeii. Street food vendors in early 20th century New York City. Scooter used for pizza delivery in Hong Kong. Disposable chopsticks in a university cafeteria trash bin in Japan. A bacon cheeseburger with fries served in an aluminum tray. 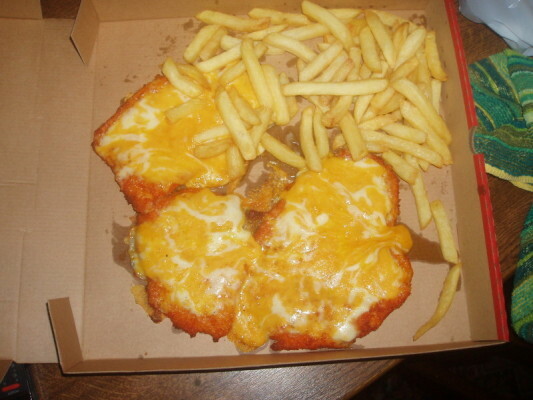 Fish and chips served in a polystyrene clamshell tray. Pizza served in a cardboard box. Boiled rice served in an oyster pail. Take-out Facts for Kids. Kiddle Encyclopedia.